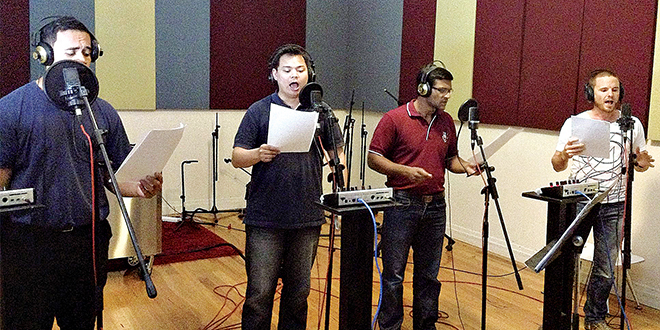 Recording prayers: Seminarians Will Iuliano, Jack Ho, Ashwin Acharya and Josh Whitehead record songs for the upcoming music CD. QUEENSLAND’S future priests will bring ancient Church music to life in a new album available next year. The first in a series of CDs will include ancient prayers used in Catholic liturgy, in particular, psalms and canticles used in sung Masses and the Divine Office inside Queensland’s seminary. Seminarian Jack Ho is among the five future priests featured on the album, which is expected for a late-March release. Mr Ho, a tertiary-trained musician who composed music for Brisbane’s Sisters of Nazareth community in Wynnum before entering the seminary, said the album was filled with prayers for their future communities. “What we are hoping to do is that through this CD we can share our prayers with the wider community, so we are praying for them as they are praying for us and the CD will hopefully be a concrete way to show them our prayer for them,” he said. Mr Ho said the seminary’s formation staff encouraged the future priests to widen their understanding of liturgical music, in particular, not forgetting the “most ancient prayers of the Church”. “Certainly the psalms have been sung for thousands of years, even before Christian times and plays a huge role in our liturgy, which is almost forgotten these days because we’ve taken the options of hymns and songs and the singing of the psalm is becoming secondary,” he said. “What we’ve been trying to do in the seminary is reconnect ourselves with a more scriptural type of music, if you like. “So the idea of having psalms we can sing for our daily liturgies came about. 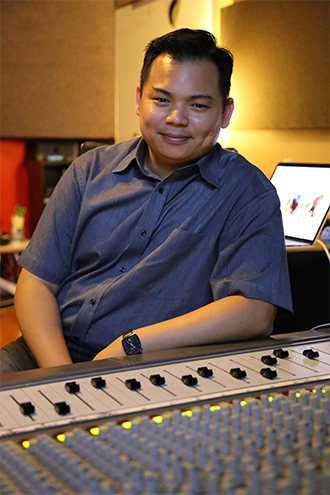 Sound master: Seminarian Jack Ho in the studio. Mr Ho said the CD would help parishes learn music that could be sung with or without an accompanying organ or other stringed instrument. “I’m hoping that through this CD people can reacquaint themselves with the beauty of simple psalm tones that we sing and that is very much part of our tradition as Catholics,” he said. Holy Spirit Provincial Seminary rector Monsignor Tony Randazzo, whose own compositions also feature on the upcoming CD, said musical preparation was an important aspect of the seminarian’s formation, particularly of sacred music for the liturgy. “We have encouraged the seminarians to get involved in music, not just popular music, but the broad spectrum of music in the Church,” he said. Hymns sung in English and Latin had made a prominent return to the seminary’s liturgical life and would be featured on the album, Msgr Randazzo said. “Some parishes have never let go of the old music but haven’t taken up the new, while other parishes have completely forgotten the old music in favour of the new,” he said. “The true Catholic repertoire goes right across the millennia. Msgr Randazzo said a number of seminarians in next year’s intake had musical backgrounds. The seminarians have at least two more recording sessions to finalise before the CD’s release early next year.